WHEREABOUTS UNKNOWN, Va. — During what was supposed to be a short weekend getaway, a new couple has found themselves in the unenviable and yet all too common predicament of being unable to reach Climax, Virginia. Subscribe to our Patreon for exclusive benefits and rewards, and to maybe buy us a beer every now and then. Climax, located in Pittsylvania County and made famous by the moonshine that bears its name, frequently draws couples from around Virginia eager to relive the romantic story of a shirtless bootlegger in overalls and his hooch-loving canine. 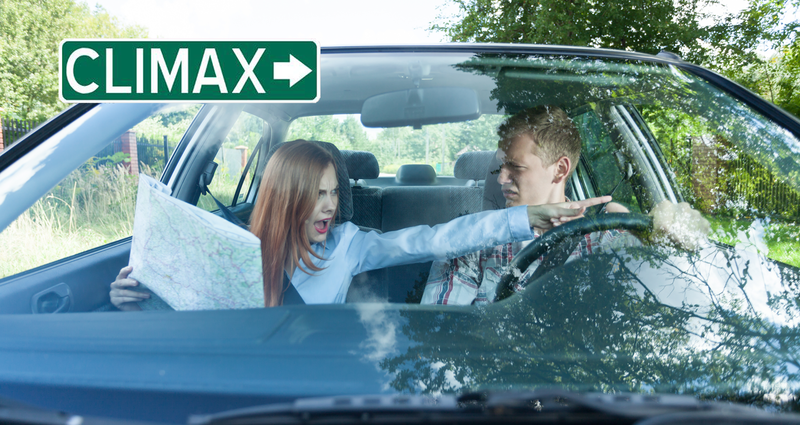 Sadly, due to its remote location and the reluctance of male drivers to ask for directions, many couples who search for Climax are unable to find it. During the almost four-hour drive, Wexton suggested a number of faster routes, but Paul stubbornly insisted that he knew the way and they were almost there. However, after one seriously wrong turn the couple instead wound up in the town of Tightsqueeze, Virginia. After pulling out of Tightsqueeze and returning to the main highway for a few miles, the couple thought that they might have inadvertently stumbled upon Climax. Unfortunately, it turned out instead to be a particularly bumpy dirt road on the outskirts of Leaksville Junction. You made this far, so why not check out our online store while you’re here?